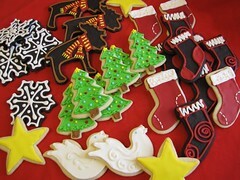 Today is the 2011 Sugar Art Show & Cake Competition! It’s the Capital Confectioners’ 7th Annual “That Takes the Cake” Sugar Art Show & Cake Competition. I was shooting for three entries, but only ended up with one again. I ran out of time to finish up the buttercream entry, and it looks like it would have been an easy win this year too. 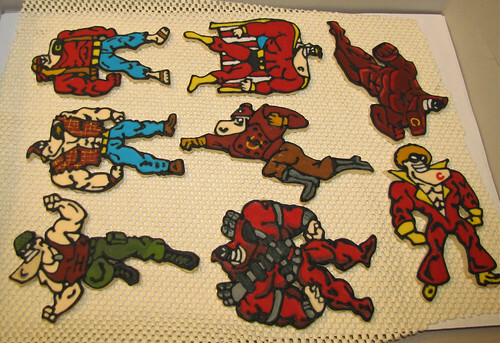 My entry this year is “The Crimson Chin Multi-verse” in the Confection Not on a Cake category. If you aren’t familiar with the comic book hero from Nickelodeon’s Fairly Oddparents (voiced by Jay Leno, hence the joke about the chin), you can check out the Crimson Chin’s wiki page. 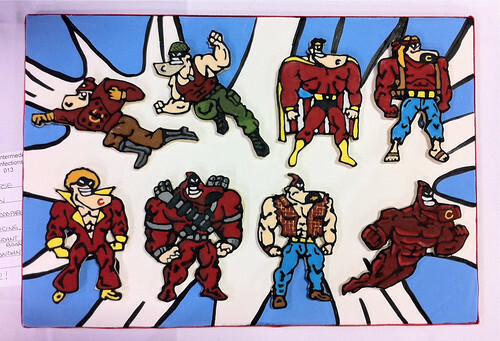 I had originally planned on doing a cookie timeline of Wonder Woman, but after watching the Fairly Oddparents episode where Timmy calls up all the different versions of the Crimson Chin from the 1930’s and up, I couldn’t resist it. Steve’s a little worried that it’s going to be too obscure for the judges–good thing they care more about the technique than the subject. 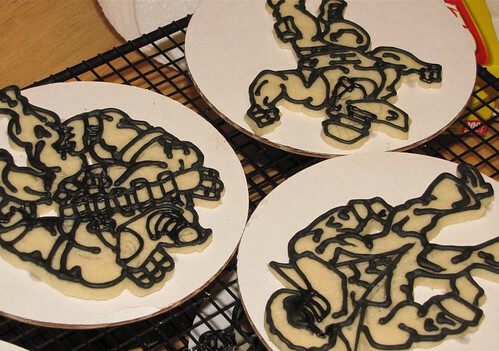 Outlines of some of the cookies. Packed up and ready to take to the show. Not a great photo since I used my iPhone, but here it is on the display board I created for it. There were only four other entries for my category when I dropped mine off (I was the 13th person registered for this category, and people were beginning to stream in with their entries as I was leaving). We’re heading back to check it out as soon as the show opens at 10:30 am. I can’t wait to see everything. I was up all night finishing this up (done at 7:30 this morning, just in time to shower and deliver it), so no promises about getting any photos posted tonight of my show favorites.